With the ever-growing sales of music downloads, and the increasing popularity of digital music and more specifically iTunes, it can be very easy to become effectively flooded with music. What I mean by this is that it is very common that many people’s iTunes library will become full of music, taking you a long time to find that song you want to listen to. Indeed a major cause of this is duplicate files. Duplicate files can appear in a variety of ways, usually due to either an iTunes error, or a re-download of a song or an album you already have. For example, if you first downloaded a single, and then went ahead and downloaded the album while adding both to your iTunes library, then this would potentially create a duplicate file. At the end of the day you need to ask yourself why you would ever need two versions of the same song in your iTunes library; what’s the point? Therefore, the need for maintaining your iTunes library arises. Duplicate files and files with errors can take up valuable space on both your computer, as well as your MP3 player such as an iPod, iPhone or iPad and you will quickly find yourself trying to find out how to get rid of duplicates in iTunes. However, the problem with maintaining your library manually is that it can take an absolute lifetime. The iTunes “Show Duplicates” option doesn’t really help a great deal, as it will list duplicate tracks on iTunes but won’t help you select which tracks to remove. So, what’s the solution? Luckily we’ve come across a fantastic piece of software called TuneSweeper, which is a free to try download for Windows and Mac OSX. Tune Sweeper lets you quickly search through your iTunes library and shows you duplicate tracks.You then manually select which tracks you want to keep and which you want to remove. 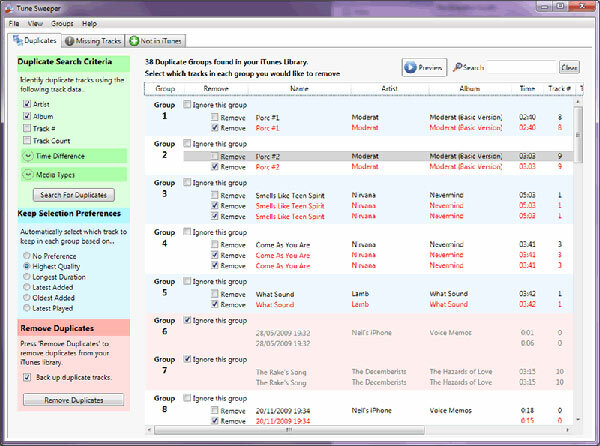 Alternatively, you can let Tune Sweeper make this selection automatically for you, by choosing the type of track you wish to keep, for example you can express a preference for a highest quality, longest duration, or latest played tracks to be kept and the duplicate to be removed. Then you simply click a button and Tune Sweeper will delete all the duplicates from your iTunes library. Tune Sweeper can help you further by helping you remove missing songs in iTunes, which are the songs that won’t play in iTunes because the original file cannot be found. 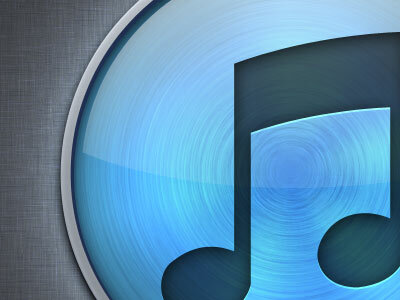 Tune Sweeper can quickly search through your iTunes library and get rid of these tracks. Sounds great right? The developers have put a lot of time and work into this software to ensure that only relevant files are removed, so you don’t have to worry about losing anything you don’t want to get rid of. One of the best things about TuneSweeper is that it is incredibly reasonably priced at $19.99 for the task it does, which is saving you hours every month by performing its completely automatic functions. TuneSweeper will not only free up space on your computer as well as your iPod, iPhone or iPad, but it will make your experience of using iTunes a whole lot more satisfactory.